This is such a well made and versatile piece of furniture, perfect for use in my modern kitchen. It is easy to assemble, looks great and is affordable! Practicality and minimalist style come together with the Tannis kitchen cabinet. The modern and contemporary-inspired design is clear to see in the rectangular silhouette and subtle grooved features. The Tannis's engineered wood frame is finished in a sophisticated dark grey or walnut brown finish. Dimensions 15.75 In. X 24.02 In. X 45.2 In. This isn’t the most sturdy microwave cart, and the instructions were very difficult to follow, even left out a few steps, only has pictures and very vague diagrams to follow, no words. I have an average sized microwave and it encompasses most of the space and sticks out about 1/2 inch . I suppose for the price it’s a reasonable deal, I just expected a little bit higher quality. The cabinet was hard to put together cause it only had the diagram to go by. It would have been easier if there were written step by step instructions. I purchased it because the color matched my kitchen decor and it is on wheels. What’s more amazing is you can lock two of the wheels so the cabinet can stay in place. Was harder than most to assemble. one step was completely missing on the instructions. A few pieces had scratches in them and some of the predrilled holes were drilled sloppy. Doors are very difficult to line up and cave in if you move the cabinet. 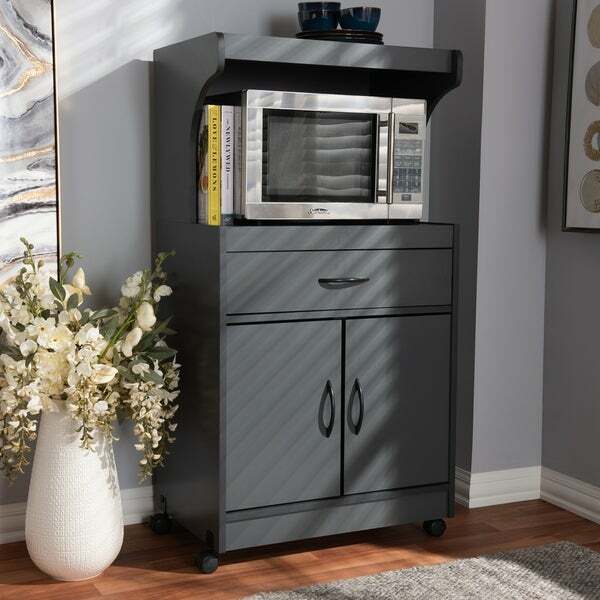 Excellent quality, easy to put together.Very nice addition to my kitchen.Highly recommend if you're looking for a medium sized microwave cart.plenty of room yet not too big. I rec'd this cabinet a few days ago. It took my daughter approximately 3 hours to put it together. The instructions were missing a couple steps but were easy to figure out. The drawer is an added bonus, however, the doors don't line up real well, but other than that, it serves its purpose quite well. It has wheels which makes it easy to move when cleaning. wonderful product, very sturdy and easy to put together. I'm usually not very good at putting things together and had no trouble. Might have taken 45 minutes to an hour to assemble. My microwave is a bigger model and it fits great, usually have trouble finding one that mine fits in. Once I figured out that I had assembled the drawer rails in backwards and fixed the problem .. it went together pretty smoothly and quickly. I nailed the back piece on for the final touch and realized I had it on backwards. Had to pull all the little nails out and put it back on. If you pay attention ...you will be very happy with the end result ! Smaller than expected. Instructions were ridiculously confusing. Several steps were not even listed on instruction sheet so had to figure it out. Took all afternoon to put together. Construction of unit is sub standard. There are scratches on some panels and a nickel sized chip came off one panel that is noticeable. Also some holes were mistakenly drilled on some panels. Poor construction. It’s a nice looking cabinets but it’s not easy to put together, it take my husband and I almost the whole day to fix it. This has to be the worst item I've purchased regarding set up! It came with NO instructions and there were a million pieces. I found the instructions on line and when my boyfriend put it together all of the instructions were mixed up and made no sense. Luckily he had enough patience to put it together with alot of thought. I wouldn't order an item made by Braxton Studio again!!! There was damage on a back board and quality of the product was not up to par. Putting it together was a nightmare. My husband almost just threw it in the garbage. The doors shut too far so they don't line up and it looks a bit trashy as a result. In hindsight I would definitely spend a little more to get something a bit more quality. "what is the total height including the top shelf?" Dimensions: Overall: 45.2 inches high x 24.02 inches wide x 15.75 inches deep. Upper shelf: 13.78 inches high x 24 inches wide x 15.75 inches deep. Drawer: 4.57 inches high x 20.71 inches wide x 14.06 inches deep. Lower closed shelf: 15.75 inches high x 24 inches wide x 15.75 inches deep. Product weight: 59.52 lbs. The total height for this kitchen cabinet is 45.2 inches.